Almost eight months ago we had decided to build a new home. I really wanted a set of Eames shell chairs and a Eero Saarinen dining table, with that idea the hunt began. When I got thinking about the total price I cringed a little so I resorted to a Burke table. My area does not really offer the opportunity to grab these very cheap. eBay and Etsy were the places I found my shells. Some were in great shape and as you can see the two blue ones were pretty bad. With out reinventing the wheel I read up on the restoration processes via Chairfag. I pretty much followed most of the steps but added a few of my own. Make the jump to read the steps I took and see the end results. These two blue shells were in pretty bad shape. They were pretty dirty and very faded. First step was to remove the old shock mounts. Some of the mounts were in OK shape but I decided if I was going to replace some, I would replace them all. A tip here would be NOT to pry up on the mount once you have the tool under the mount. If you pry up you could remove more fiberglass than you want to. The white shell was a perfect example, the old glue really held on to the fibers. Just continue to tap around the mount until you are all the way through. Once you have removed the mounts, you have to now sand the remaining glue from the shell. I used a hand held sander and some medium grit sandpaper. While I sanded, I kept the area wet using a spray bottle and just a little dish soap. Always use something to cover your mouth and nose, You do not want to be breathing dust and fiberglass. After the glue was removed I then used a finer grit to finish up the area. Next I sprayed down the shells to get rid of any dust that had been left behind. I let them air dry for a day before the next step. Finding replacement shock mounts was easy. I just went back to Special K Products. I used their shock mounts for a couple of DCM chairs that I restored. You can also get the two part epoxy from them. I have to say that they worked perfectly, two for two from these guys! To mark placement of the shock mounts, I attached the mounts to the base and then placed the base on the flat spots where the mounts are supposed to go. I then used a pencil and traced the mounts leaving an exact guide were to apply the epoxy and the mount. I mixed the two part epoxy, which is quick set and placed just enough so when the mount is pressed to the shell a little presses out around the edges of the mount. After you have set the base on the shell and pressed, you will need to hold it in place for a few minutes until the epoxy is firm enough to unscrew the bolts and remove the base. You could also just glue these on one by one now that you have the exact location. Zach, from chairfag has a better method but I did not have the old base part that he used. Now that all of the mounts were on, the chairs needed to be cleaned and sanded. I read somewhere that OxiClean worked good on embedded dirt. I found a gel spray from OxiClean, I first prayed down the chair and then sprayed the chair with the gel and let it sit for a few minutes. I then used a fine sanding block and started to work the gel into the chair. I have to say that the combination of sanding and the OxiClean gel worked amazing, it really cleaned up the two blue chairs quite nice. On the other shells I just used a scrub sponge. After I was satisfied I rinsed them off really well and let them air dry for a couple of days. Make sure you wear a mask and keep the area wet during this process. The next step is applying the Penetrol and in the UK it is called Owatrol. It was pretty easy to put on. Wear gloves and use a lint free rag. Soak the rag and apply it to the shell. Pay attention to the surface and whether you are putting too much on, you will be able to see pooling or over glossy areas. I used a dabbing/rubbing technique for the application. Apply to the backside then screw the base on, next apply to the front side. I did not apply it to the white shell as it may turn yellow over time. I actually ended up putting 3 coats on the blue shells, one heavy coat and two lighter coats to even out the shine. This is an oil based product so it will need a few days to cure before you go sitting on them. The next challenge was to find some basses. My first love is the walnut dowel base but I had mentally written these off due to cost. I did a little research and came across a company called Modern Conscience. They offer the whole range of reproduction basses at some pretty good prices. All of their basses are made in the US. I took the plunge and ordered 6 bases. At first inspection the quality was there. The walnut was beautiful with a great wood grain. My day time job has me working as creative director for a manufacturer and we see a lot of finishes, coatings, nuts and bolts. I can honestly say that even the hardware for these bases are quality. These last few images are of the final chairs done and assembled with the new bases. I am pretty pleased with how these turned out and they look great under my Burke table. Now to find something to put in the middle of the table! Nice work! They look amazing! Sweet. Adds so much personality to the space. How fun for you! Amazing colour combination!! Congratulation – Thank’s for sharing!! Gah, these came out so nice!!! Tyler, that setup looks SOOO GOOD. Nice work, excellent choices all around. Thanks everyone, the project was fun and rewarding. The shells look really shiny ! This is so useful! I just got an original vintage bullet style planter and the fiberglass is very in need of some TLC. Thanks so so much. It’s amazing to me that any kind of look – especially an expensive Mid Century Modern on – can be created on a dime or two. Kudos to you for your hard work. An enjoyable read – and the refurbished chairs look stunning. Was the colour mix intentional – and if you had to have a sixth chair, which colour would it be? chairsmith, thanks for the kind words, most of the colors were intentional except for the green one. The green one was such a good deal I couldn’t pass it up. The sixth color would be red. wow! these are great. you did an awesome job refinishing the chairs. and thanks for all the links, too! Beautiful job! I love how the colors came out. you did a great job, thanks for the mention of our chairfag.com website! glad to be an aid in your wonderful project. the advice of keeping the area wet and dust free is very sound, fiberglass particles are a bad bad thing. Glad that you found our tutorial helpful. The chairs look fantastic! These look amazing! Have two chairs that have been painted orange. Do you think I can follow the steps you’ve outlined to remove the paint and restore them to their original colour? Pearl, that is a tough one, I have yet to see anyone remove paint successfully. I think it is difficult to remove the paint without damaging the fiberglass but it may be worth a try. Hi there, thanks for the post. I’ve got a couple of similar chairs I want to restore. I’m in the UK and have searched for owatrol but I’m not sure which product to use as they seem to make a lot. If you could point me in the right direction it would be much appreciated! WOW! I am soooo impressed – can’t believe the transofrmation – and all your ingenious findings. I can’t also believe some people just said ‘nice’ – what nice? Fan Tab U Lous Iam a follower now! 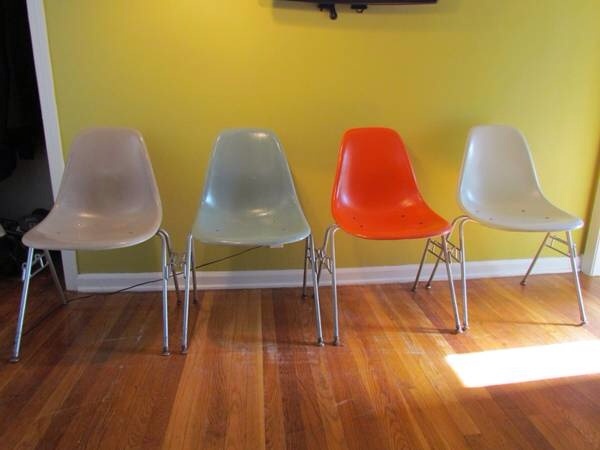 So, would I just be stuck with dirty looking white shell chairs or is there an alternative to penetrol for the back white section of an Eames shell chair? Sanchez Design Studio, you should still be able to clean them. Don’t use something that will really scratch up the surface. Sealing them may be a different story. You could try some clear polyurethane? You could spot test some different products? Hey there! Great chairs…May I ask, were these already the narrow shock mount style or the wide? If the wide, when you glued the mounts back on in the narrow position, was there already a narrow flat area for each chair i.e. do the chairs come with flat areas for both narrow and wide fixings? Thanks! Hannah, there is a flat spot for the narrow and the wide on the base of the chair. Most of these were wide mount and changed to narrow. Hannah, if you use the bases from Modern Conscience, you won’t have to change the mounts, they work for the wide as well. Email them to confirm that info, ask for Amanda tell them I sent you. Hey. I’m in the UK where we can buy the dowel bases for the wider mounts, but they are prone to problems where the mounts come away (due to increased pressure on the mounts from the wide configuration dowel base). very very useful information ! thank you, and your chairs look great ! ! great piece of advice!!! you saved me hours of work! Tara from Liverpool!!! WOW! Amazing job. Your home is gorgeous with all the mod furniture. I would like to know if you would agree to restore a rocking chair Eames for me and how much it will be cost? Nicolas, I assume you are in France? The shipping alone would be really pricy. I live…., sorry for the mistake. No news, good news ! :=))) Hope that you did not forget my request. Thanks. Nicolas, I tried emailing you but it did not go through. Honestly I have too much on my plate right now. We just had a baby two weeks a go. Sorry but I will have to pass on this one. Yes, I understand perfectly. There is no problem. I love what you did with your chairs. I’m looking to get some dowel base but I’m not sure what color should I pick up. I really like the wood color of your chair but I can’t tell if its maple or Walnut. The base I found in store in Canada are darker for the walnut than your photo and the maple look more like birch. Erika, sounds like you need to use something that will really get in the fibers. I would try some Oxy Clean and some fine sand paper or something with long bristles. You don’t have to use Oxy Clean but find some cleaner that will foam and react to oxygen. If you sand, always wet sand. Alexandra, I have heard that people are using automotive clear coat on the white shells. I havent seen a chair done with it though. I just started the restore process. How long do we wait between coats of Penetrol? Michele, I waited a full 24 hours between applications. hello, I am very impressed with the final outcome of your shell chairs! Recently I have gotten this idea in my head that I MUST have 3 side shell chairs on 3 counter height walnut dowel bases. These are available for $600 at modernica but I am not interested in paying anywhere near that much. I’m a DIYer. Anywho, long story short I bought 3 shell chairs at a local vintage shop for a good price. They did not have the bases and I ordered 3 bases from Hong Kong, the price was right and the dealer had 100’s of great reviews on this exact product. All seems great until i realized that these bases don’t line up w “stacking” herman miller shell chairs which is what I have. Although I am very good at improvising I’m wondering if moving the shock mounts is as easy as you made it look. Any advice? Thanks!! Looks really really good! Did you use Owatrol Gelcoat Restorer? Thanks Claus, I used Penetrol, which is the same as Owatrol. Great job! Can you tell me the diameter and the height of the shock mounts you used? Which product of Owatrol did you use please? I am confused with all those products in their website. Albert, I didn’t use Owatrol, I used Penetrol. I have a Luther Conover fiberglass rocking chair shell. Do you know where I might be able to find replacement frame and rockers. Thanks for any help. Pam, I think eBay would be your best bet, I don’t think anyone is making replacement parts for those. Sorry not much help from my end. I have a somewhat tangential question: I’m looking for a solution to change the gliders out to something more compatible with ceramic tile flooring. We keep shredding up those self-adhesive felt discs, and any nylon gliders that I find seem to all have a nail-in application. jrobgood, I am afraid I can’t be much help with that one. Maybe someone else will have an idea. Hi tyler, chairs look great. I am trying to replicate the same project .. however I am having an issue with the epoxy. I’ve attempted 2x with 2 part epoxy from my local hardware store that is “meant for fiberglass + plastics,” but neither form a strong bond (even after setting for 24 hours). Do you recall specifically the brand of epoxy Special K Products supplied to you? any recommendations? Thanks! Jon, the tubes that Special K sends out are delabeled so I can’t really tell you what they use. I can say that they have held up really well. I haven’t had a single problem. this site, and I used to visit this blog daily. Great article. Helpful information. Thanks! articles and blogs are certainly sufficient for me personally for a day. of this website is also first-class. Have a great fun. very helpful blog, especially for someone like me. Warmest thanks! They’re beautiful! I don’t know how much room or time I have for a diy project like this…but your end result tempts me to try! really inspired me, I’m so happy to read this. I’m wondering if Krueger fiberglass chairs fit the eames wooden basses as well? Having a hard time finding Krueger replacement parts. You said that you didn’t use the Penetrol on the white shell because it would yellow. What did you use on the white shell? Pam luckily the white one came pretty clean and wasn’t to faded. I didn’t use anything on the white one. Just cleaned and changed the shock mounts. Hey thanks for the article. It has been very helpful. I’ve rebased a few chairs now, to varying degrees of success. In the past I’ve simply overtighted the screws to pop off the old shockmounts without issues. When I attempted this on my most recent project, and the adhesive seemed to be a bit more stubborn and the screw ended up going through the shockmount damaging the fiberglass. I’ve sanded quite a bit and conditioned in hopes of dulling the appearance of the damage to no avail. I was curious if you had any ideas as for potential solutions to my problem. Thanks so much for your time! Andrew, that is a tough one. Is the damage mostly on the underside of the chair? Honestly I would just fill the damage in with some Penetrol on the underside to “strengthen” the spot and just live with the “character”. You may also find someone that works with fiberglass if you really want it repaired. Sorry but that probably wasn’t much help. information through your blog; I will share this to my friends as well. Hey thank you so much for posting this. I followed it step by step and finished four white ones which were in much worse shape then yours lol but they’re done now. It be nice for other people following if you showed a non shiny wet photo during the sanding step. Because thats definitely not what it looks like once it dries or during the dust storm of sanding. Lol i thought i had screwed up. For people reading this… If when your sanding the chair and you think your chair looks horrible… The chair will look like scratchy off colour crap when it dries. No worries it will go away once you continue to the final step! Good luck everyone. Chris, nice work! thanks for the additional info. studies but also help to learn in the practical life. Any experience with the scholastic shell chairs with carriage bolts running through the fiberglass shells? Are the bolts epoxied in place, or can they be nudged out with a mallet? Also: what to do if the shock mounts need to be replaced?? So if I don’t intend to epoxy the holes and instead keep the bolt-through design, how do I safely remove the bolts without damaging the still-intact shocks, and how would I replace any damaged shocks? Thank you so much for the great tutorial. Does the Owatrol/Penetrol treatment last, or do the coats of product vanish with time and regular use? Since you restored the chairs, did you have to apply the product again? Nick, I think it just depends on how much you use the chairs. It should be a long time before you have to think about applying another coat. Do you think the shock mounts and the same epoxy would work the same? Can’t wait to hear back from you soon! BUNNIEKA, I am not so sure about the plastic chairs. I bet if the surface is rough enough the epoxy will stick. Thank you Tyler! I’m gonna buy one and see if it works. I’ll let you know how it goes! How have your mounts held up after 5 years? I recently restored 2 shells using new mounts and black cyanoacrylite 1 part glue from Modern Conscious, and had the mounts on one chair fail today after a month. So disappointing amd I know from their website they have done a lot of research amd testing of different adhesives. What brand/type of two part epoxy did you use? So far so good, I haven’t had a single problem. I used the epoxy that Special K provided with their mounts. Question on the Modern Conscience bases as I just picked up a few. Where your brackets are fastened to the top of the dowels base by machine screws and nuts — do yours wiggle or move at all? Yes, same set up. Once I got the chair attached to the base everything was and still is sturdy.